the river, its banks and bridges - and flourished there for six weeks. Fusing art with the ever-changing natural elements, artists worked alongside marine and structural engineers, scientists, technicians and local authorities, to push boundaries and enhance the cultural regeneration of an undiscovered part of central London. This dramatic visual landscape, set out to inspire the public by offering a spectacle for community, national and global audiences. We were overwhelmed by people’s hunger for artistic stimulation on the Thames, so in 2010 we commissioned and produced more artworks and built audience interaction and participation. We are working towards DRIFT becoming a biennial event on the calendar and are currently looking for financial partners. Commissioned and Produced by Illuminate Productions. Supported by The Henry Moore Foundation, Arts Council England, Mayor of London, Southwark Council, Canary Wharf Group, City of London, Tate Modern, Better Bankside, Port of London Authority, Transport for London, Canal and City Trust, Network Rail, Docklands Light Railway, Walki and Traxon Technologies. Key coverage total reach 911 million. Media included: BBC News, Discovery Channel, BBC China, Wall Street Journal, New York Post, The Independent, The Times, Daily Mail, The Telegraph and The Guardian. Love-Love is the name of a renovated and motorised sailboat which the artist has saved from the waves. The completely functioning vessel was captured in its permanent sinking position, even while sailing. Recreated for this prime location on the Thames in 2006, Realty was produced as an easy to assemble flat-pack, which could be quickly transported and erected at desired locations with minimum disturbance. Cotterrell placed an ad in local papers when Realty was sited. Inviting bidding for a 'Desirable bijou property boasting 360° water views', Realty exposed the absurdity of assertions of ownership over the natural world. Realty is an uninvited installation seeking a response. Its temporal nature, the fact that it can be moved around in the back of the artist's car and erected in less than 10 minutes, suggests a multiplicity of sites, onlookers are invited to consider their own choice of location. Installation artist Frank Bölter charmed home and international audiences with his moving performances of To the World’s End. 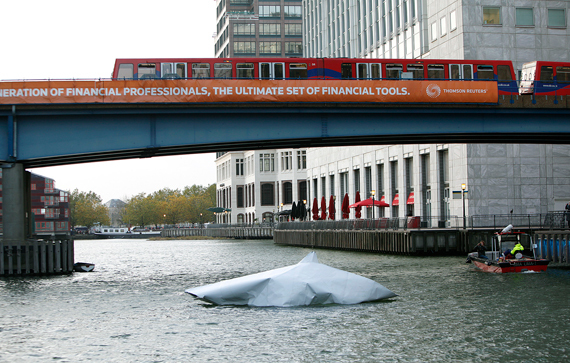 The poetic performances, in which public volunteers helped fold and launch an origami paper boat on the waterside before the artist sailed away in it, brought Frank Bölter to international attention. People crossing the Millennium Bridge inexplicably recalled seaside experiences and holidays. Mariele’s sound installation disorientated passers-by, surrounding them with the sound of waves, seaside chatter, the cries of seagulls, and the eerie knocking of rigging against masts. Viewers crossing London Bridge witnessed a new life-form living in the Thames. Mythical creatures evolved to form a family unit during the course of DRIFT. Only appearing at dusk, crowds gathered, and they developed into an apparition - like the creatures of folklore before them. 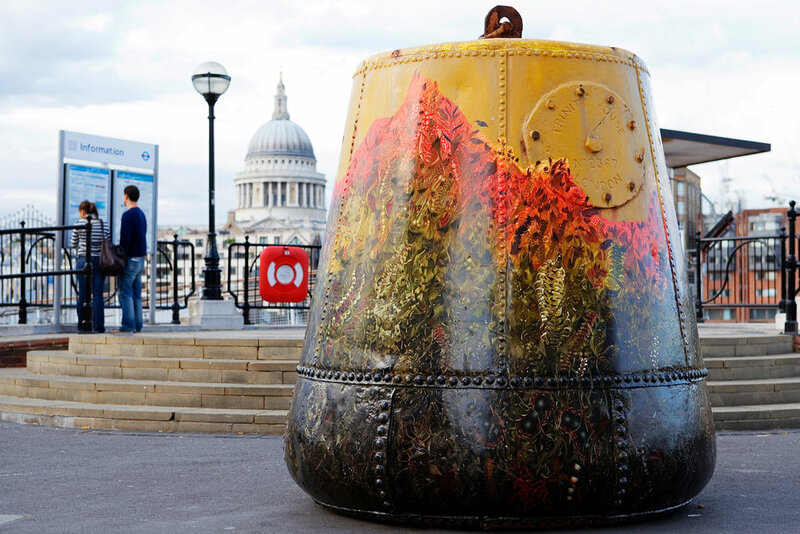 Weird and wonderful plant-like forms were hand painted onto a redundant river buoy on the Thames walkway. The unearthly lush plant forms appeared to be growing, morphing and climbing the buoy. A large-scale interactive painting, bearing witness to those who have drowned in the turbulent waters. As it rose and fell with the river’s tidal flow, the mirrored surface reflected a distorted view of the river’s movements while also capturing the audience’s image within the ‘painting’. This installation celebrated the Thames renewable qualities, as it was constantly changing with its environment. James Capper’s mysterious Sea Light was a wind-powered fog light that was placed directly in the waters of the Thames. Set on a mechanical structure reminiscent of 1960’s engineering, the wind-powered light glowed from the river from dusk until dawn. A French artist who creates installations and sculptures, often in public spaces. He draws the viewer in by constantly approaching his themes with some form of humour and absurdity, while also providing sharp criticism on social trends in present-day society, such as the public–private debate. The difference between culture and nature are also regular features in his art. Solo Exhibitions Include: Public Sculptures; Galerie GP & N Vallois, Paris, France (2015); Julien Berthier; KÖR Kunst im öffentlichen Raum GmbH, Vienna, Austria (2015); The Same Différent; Onomatopee, Eindhoven, The Netherlands (2014); Revolution Light; Crystal Palace, Bordeaux, France (2013); A LOST; Galerie GP & N Vallois / Project Room, Paris, France (2012); Billboard, International Gallery, Oswiecim, Poland (2012). Group shows include: Inhabiting the world; 8th Busan Biennial, Busan, South Korea (2014); Le Mur; works from the collection of Antoine de Galbert (2014); Get Up; Cultural Centre of Belgrade, Belgrade, Serbia (2014); O’Clock; Triennial di Milano, Cafa Art Centre, Beijing, China (2015). A British installation artist who works across media and technologies to explore the social and political tendencies of a world at once shared and divided. His practice is typified by an interest in intersection: whether fleeting encounter or heavily orchestrated event, Cotterrell’s works explore the human condition and the breaks or nuances that can lead to a less ambiguous understanding of the world they inhabit. Encapsulating the roles of programmer, producer and director, Cotterrell works to develop projects that can embrace the quiet spaces that are the sites for action, which might (or might not) be clearly understood in the future. Solo Exhibitions Include: Paranoia of a London Attaché Case, London Transport Museum (1996); Reference Frame, Daniel Arnaud Contemporary Art, London (2003); Dead Reckoning, Museum of Garden History, London (2005); Aesthetic Distance, Daniel Arnaud Contemporary Art, London (2009); Hill 33, Forest of Dean Sculpture Trail, Gloucestershire (2010); Slipstream, Peckham Space, London (2011); Monsters of the Id, John Hansard Gallery, Southampton (2012); Empathy and Risk :Three Mirrors and a Wall, Daniel Arnaud Contemporary Art, London (2017). A German sculptor and performance artist whose projects are distinguished equally by their powerful poetic imagery and by the precision of their execution, often carried out under the difficult conditions of the public sphere. His projects leave traditional definitions of object and practice behind, expanding his installations into the realm of the performance. Solo Exhibitions Include: Origami Refugee Camp Detmold, Germany (2016) Transforming Glasgow, Scotland (2016); YouFo, Montag Stiftung Kunst und Gesellschaft, Bonn (2016); To the Worlds End, Goethe-Institut Colombo, Sri Lanka (2015); Origami Refugee Camp Brussels (2014). Group shows include: Test Unit; Glasgow, Scotland (2016) Galway 2020, Ireland (2016); Port Eliot Festival St. Germans, UK (2016); Travellings, Marseille, France (2016); When Two World’s touch, Galoshan’s, Glasgow, Scotland (2015); Moving Out, Hikkaduwa, Sri Lanka (2014). A German artist living in Britain who explores landscapes from photographs, postcards, experience and memories. Neudecker uses sculpture, film, sound and photography to create a sometimes playful frisson between historical cultural representations of the sublime landscape and our perception, imagination and memory of the reality of experience. An Australian artist who has become widely known for his pioneering works including innovative approaches to projection mapping in unconventional sites. His site-responsive works have animated natural environments and features such as trees, rivers and mountains, as well as public art projects in urban and architectural space. He is also renowned for his site interventions at live events, including iconic works at music festivals across Australia and internationally. Over recent years he has extended his digital arts expertise into work with diverse communities, enabling large-scale participation as collaborators in contemporary art projects. Craig has also produced a diverse body of work for major institutions, public art commissions, live events, and community projects. A British artist who regularly sites his painting on sculptural or architectural surfaces creating a world known and imagined. Rendered with extreme detail and an ineffable sense of both reality and the fantastical, Harper’s works are arenas for discovery and camouflage and mark the exuberance of growth as well as its inevitable companion, death and decay. 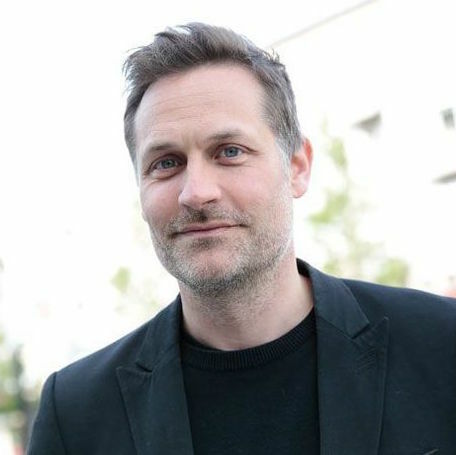 Harper is a senior lecturer on the MFA Fine Art programme at Goldsmiths College, London and he works with galleries in Seoul, London and New York. An American painter, performance and installation artist. Evangeline’s diverse practice includes large-scale site-specific installations using mirror-like surfaces. In these installations, viewers can find their reflections moving through bullet-marked environments of woods or water, the installations are linked with environmental art. In New Orleans, she filled a cottage with fertile dirt from the Mississippi River, which sprouted new growth from seeds she planted. Her work is included in private and public collections in Australia, Canada, China, France, Ireland, Saudi Arabia, The Netherlands, and the UK. Important site-specific permanent installations include: The Fields Sculpture Park, Omi International Arts Center, and Michigan State University. A British artist and draughtsman whose work adopts the techniques, materials and complex problem-solving processes of innovation and engineering to develop the possibilities of sculpture. Capper completed his MA at the Royal College of Art in London. He is the youngest ever artist to be awarded the prestigious Jack Goldhill Prize for Sculpture from the Royal Academy of Arts, London.